In the past, massages have been considered indulgences and only for the wealthy, but not anymore. People have learned that massages have a variety of benefits from the reduction of stress to the loosening of tight muscles. At Heaven & Earth Day Spa, owner Maura Malia employs 20 therapists whose jobs it is to make clients feel pampered and relaxed. Heaven & Earth is known for its massage therapy. Be it deep tissue, sports, pregnancy or therapeutic, everyone can find something to fit his or her needs. There are therapists trained in oncology massage, which is a specialized massage for those fighting cancer. They also offer reflexology and polarity. “With relaxation or deep tissue, it doesn’t have to beat you up to be effective,” said Malia. “More people are taking care of themselves in better ways.” With the increase in education around massage therapy, more people are seeking out this type of treatment as an alternative to seeing a doctor or specialist. “More competition is better for education. The more education the more people are getting [massages],” said Malia. Trends in massage therapy have changed over the last 10 years, Malia said. Ten years ago, only people with disposable incomes were getting massages. Now it is considered more like a necessary treatment. Reflexology has also increased in popularity to where it is almost as popular as massage, Maila said. “Reflexology is the application of appropriate pressure to specific points and areas on the feet, hands or ears. Reflexologists believe that these reflex points correspond to different body organs and systems, and that pressing them has a beneficial effect on the person's health,” according to the University of Minnesota. Heaven & Earth also offers facials, manicures, spa pedicures, nail art and waxing. A new full spectrum, infrared, detoxing sauna is being installed to help with various ailments. It has shown to help assist your body in ridding itself of deeply imbedded toxins. There will be a tablet in the sauna to give the user the option of listening to music, watching a movie or checking Facebook. “Our employees are what make Heaven & Earth what it is. We create a soothing and compassionate place,” Malia said. know the clients. Clients don’t feel like they are rushed and when an hour massage is scheduled, they receive a full hour on the table. “There is nothing truly like Heaven & Earth around here. We have a more homey-feel, less clinical,” Malia said. Most of the Heaven & Earth clients are women, but more men are scheduling appointments every day. They also have a number of children who are clients. In many cases, time and money are barriers to getting treatments. Heaven & Earth offers gift cards, and many clients ask for services for birthdays, Christmas and Valentine’s Day. Couples massages are very popular for anniversary and Valentine’s gifts. For seven years, Heaven & Earth has been offering a membership plan where once a month members receive a core service of their choice, from massage and reiki, to a facial or spa pedicure. Members also receive: An additional 20 percent off all other services/10 percent off retail products /10 percent of gift certificates, all for $67.95 per month. They have had members who have been coming regularly for six or seven years. “Most people get their gym memberships and don’t go. No one gets their massage membership and doesn’t go,” said Malia. One more benefit to massage therapy is that, “Human touch is so important. Just being touched by someone regularly is so good,” she added. Heaven & Earth is always looking for new massage therapists to staff their seven day a week schedule. The spa is open from 8:30 a.m. to 8:30 p.m. Tuesday through Saturday and 12 p.m. to 6 p.m. on Sundays and Mondays. Malia encourages everyone to get massages at least once a week, but on average people get them once a month. 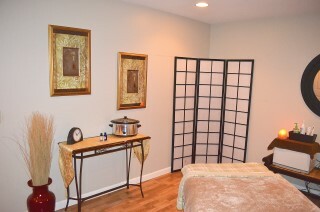 To schedule an appointment, book online at: www.heavenandearthmassage.com or call 893-0033. Heaven & Earth is also on Facebook. Across the Sebago region there are thousands of camps that need attention year round, be it spring cleanup and plantings or weekly turn over on a rental property. Sandra Donnelly, owner of Camp Care, LLC, is the one to contact. For approximately five years, she started watching over camps in the winter doing camp checks. “I started taking care of people’s camps while they were not there,” Donnelly said. In addition to shoveling decks and paths, making sure the heat is turned on in the winter and doing general checks, Camp Care has added regular housekeeping and post construction cleaning to its repertoire. “Before the house is sold to the new owner, we clean ceiling to floor so they move into a nice clean house,” she said. 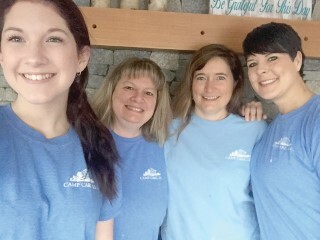 Locals can also take advantage of Camp Care’s team of housekeepers, among many other services throughout the year. When the company first opened it employed only summer workers. Now Donnelly hires approximately 14 summer employees and three stay on during the winter for regular housekeeping duties. Donnelly will shovel paths for oil and gas as needed and can take care of snow removal, from plowing to shoveling roofs. If her crew is too busy to get to it right away, she can refer you to a network of local, reputable professionals. 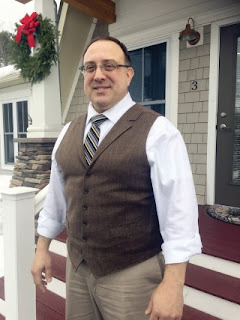 The clients Camp Care works with are investment bankers, architects, and people from out of state like California, Ohio, Massachusetts and Rhode Island. One woman rents to pay the taxes on her camp. When Donnelly does the camp checks for her clients who are not in the area, she sends them a picture of the camp to provide piece of mind. Locals can take advantage of these services too if they are leaving for a winter vacation. Whether it a week or a month, Camp Care will check on your home in your absence and do things like check the mail and water plants. Her slogan “We Care When You’re Not There” is truly their mission. “I’m trustworthy. I treat each property as if it was my own. If I notice something off, they’re going to know about it,” she added. Camp Care opens and closes camps, does weekly cleanings in homes from one to 16 beds. It also offers camp rentals and rental management. There are three new rentals not booked for the summer on Panther Pond, Sebago Lake basin or Long Lake for those interested. They won’t last long. She has many other rentals on most of the other lakes in the area. For those looking to rent their camps, Donnelly said it’s not a decision for everyone. “I talk long and hard first. It’s not for everyone. People will touch your stuff. Things will get broken,” she said. One client who is now renting her property had to think about it for two years before she was ready to rent. Camp Care is preparing for spring. “In May we will open camps, docks go in, lawns get raked, gardens tidied up if needed. Inside we make beds, and wash a lot of dishes,” she said. Camp Care is hiring for the summer season. Donnelly is looking for people with OCD or those who consider themselves neat freaks. She also is looking for people who don’t mind working Thursday through Saturday. She likes to find people who are local. This past year, Donnelly and her family built a home in Windham. She plans to expand again offering the ability to manage construction projects. She can help people from away find contractors. “I can help them do the projects they want to get done, for example steps, decks, or put in a full basement,” she said. Putting her clients in touch with the right contractors, gives her the satisfaction that the project is doing done correctly. Most of the properties Camp Care manages are on the water, but they don’t have to be. Camp Care takes care of rentals and manages camps from Windham, Sebago, Gorham and Raymond, but Donnelly doesn’t rule out other places on a case by case basis. Donnelly is licensed and insured. For more information on Camp Care, call 207-712-2238. They can also be reached by email at Sandra@campcarellc.com, visit www.campcarellc.com or on Facebook. With a whole person approach to medicine, doctors Richard Wilkins and Alan Bean treat patients at Raymond RediCare with compassion and respect. At a time when insurance companies are making doctors conform to their rules, doctors at Raymond RediCare have a different model of primary care. “At home, at work or at play we manage most things very well,” said Wilkins. Raymond RediCare has state of the art equipment, using technology to keep them in contact with specialists and to give patients access to information 24-7. “Technology has enabled us to sustain cost effective value,” said Wilkins. In the office the doctors are able to do x-rays, use an eye microscope, do laser treatments and simple casting. “It’s been an amazing experience. It’s a great place to practice medicine,” said Wilkins, who has run the practice since August 2014, at 1278 Roosevelt Trail. The building used to be a bank, but was converted into what it is today. With the rural area model of medicine, the work they do can save patients time and money. “People love us because they can see us within 24 hours. Some patients never see their primary care doctor for acute issues,” Bean said. Raymond RediCare is both an urgent care facility and a primary care office. The growth they have seen in the last two years has been beyond their expectations, said Wilkins. He added that most of the year the urgent care cases they see are established patients. In the summer, they leave extra openings for those from out of the area that are visiting for the summer or work at an area summer camp. Dr. Bean has been with Raymond RediCare for six months. “I had a patient tell me I was the first doctor who made him feel listened to. We try to give each patient extra time, while being respectful of the next appointment,” he said. Dr. Bean embraces the “eclectic nature of our business.” The two doctors complement one another’s skills, they said. Their specialty together, is providing primary care and occupational medicine. One of the secrets to their success is the staff. “Our staff is remarkable, friendly, caring and capable. They are predictable,” in their attitudes, said Bean. There are two x-ray technicians, an LPN and two front desk/medical assistants on staff. Not being affiliated with a particular hospital gives the doctors an additional layer of flexibility when it comes to the care of their patients. Each hospital in the region, from Central Maine Medical Center to Maine Medical Center, has something they are better at than another hospital. Some hospitals are geographically closer to where the patients live and others are great health partners in the community. With narrow band HMOs becoming an issue in the field, patients can expect to have longer waits in healthcare delivery, said Wilkins. He does not want the practice ruled by corporations. Patients who see Wilkins and Bean can expect to have the appropriate amount of time spent on their concerns and needs. Preventive health care allows them to “access preventive measures that will have an impact in the next 10 to 20 years.” The annual physical is really data gathering, said Wilkins. Raymond RediCare doctors not only can show them the numbers, they can give the patients opportunities and ways to improve their health. “We engage them as partners in their own health,” said Bean, who has worked as an emergency room doctor as well as an occupational and urgent care doctor. “It’s given me a whole new lease on medicine,” he added. “People look at RediCare and they’re not sure what that is. It is premium care with a personal touch. We provide an expanded medical home in a rural area,” said Wilkins. Raymond RediCare has a goal to be cost effective for uninsured patients as well as accepting most insurances. “We will continue to evolve to meet the demands of the area,” Wilkins said. For more about Raymond RediCare, visit them on Facebook and existing patients can use the Patient Portal. To schedule an appointment, call 655-6181.